If your dog has developed a bad habit of barking, the worst thing you can do is yell at them to be quiet. By doing this, your dog will just think you’re barking along with them and will never actually learn from your scolding. Instead, take the time to train your dog to actually understand that barking is considered a bad behavior. This requires a lot of patience and dedication, but the results will be well worth it. 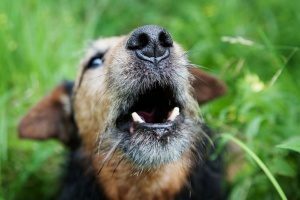 Take some time to discover a few tips to stop your dog from barking so that both you and your dog can have a peace of mind. It is imperative that you remain consistent when training your dog not to bark. You can’t let your dog get away with barking in some instances but not others. If you lack consistency, your dog will become confused and will leave you wondering why the training isn’t working. This also means that every member of your family must apply the training methods to ensure your dog actually learns. Even one slip up could cause a setback to your dog’s training so you need to make sure you are highly committed to your efforts. The end result will be worth it. Dog’s don’t just bark for no reason, so you need to figure out why they are barking. Once you have targeted the reason(s), then you can remove the temptation(s) so your dog will stop barking. If your dog is barking at passersby, then consider closing the curtains or moving your dog to another room so they can’t see. By doing this, you are removing the motivation and temptation to bark. Dogs can bark for numerous reasons that include: boredom, restlessness, hearing or seeing something, having to go to the bathroom, hunger, attention, encountering a stranger, etc. In some of these cases, you may actually want your dog to bark, so a targeted training method can help you eliminate the unwanted instances and help you remove the things that are causing them to bark. 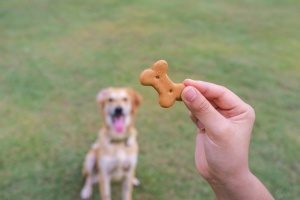 This tip goes beyond just randomly giving your dog a treat when they’re quiet. When your dog is barking you must completely ignore them. Turn around, don’t look at them, and don’t touch them. You want them to know you are purposefully ignoring them. Once the dog finally stops barking, that’s when you can turn around and praise them with a treat. You’re teaching the dog that being quiet is a good behavior. Once they catch on to what you’re doing, lengthen the amount of time you require them to be quiet to earn a treat. This will help reinforce the behavior. If your neighbors have been complaining about your dog barking when you’re not home, then your dog may be experiencing separation anxiety. To help ease this anxiety you should create a safe place for them away from your front door. Consider putting them in a specific room that you’ve adorned with decoration to make them more comfortable and include a bed or toys. You could also put them in a crate if it is a more suitable option for your home. You want to create a cozy and safe place that will help ease the anxiety they feel in your absence, while also removing many factors that could entice them to bark. While it may seem counterproductive at first, you should teach your dog to bark on command. By training them to bark when you say “speak”, you can show them when the time is appropriate for them to bark.Once your dog has mastered “speak”, you can teach them “quiet”. This is done by asking them to speak, and then asking them to be quiet. When they appropriately respond to “quiet”, you then reward them with a treat. Dogs that have had more exercise will not only benefit physically, but they will also be more tired. A tired dog is less likely to bark or be bothered by a tempting distraction. Barking can also be caused by pent-up energy, restlessness, and boredom. Your dog may bark for more exercise. While this tip alone probably won’t stop their barking altogether, it will certainly help in conjunction with the other tips. Sounds can often entice your dog to start barking, so use a fan or a noise machine that acts as soothing background noise. Just like blocking your dog’s view can help them to stop barking, lessening the outside sounds they can hear will also help decrease their barking. Still having problems with your dog barking when you’re not home? Hire Paw Pals, a dog walking and dog sitting service. 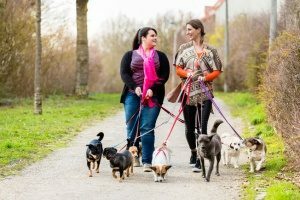 Having a dog walker come while your away will ensure that your dog doesn’t get lonely, is well taken care of, is getting enough exercise and burning off excess energy (all of which could be causing your dog to bark). Your dog walker should also be informed of any training you are doing to make sure they are in line with what you’re trying to teach your dog. If you also find yourself needing to go out of town, a dog sitter may be the best option for a noisy barker. They will be far more comfortable in their own home because they can keep their same routine and they can avoid car rides or any other activity that could potentially stress them out. By having a Paw Pals dog sitter, you’re not only giving your dog a great experience, but you’re also getting one yourself! You’ll have peace of mind knowing that your dog is well-taken care of, that you can be in constant contact with your dog sitter, and that you won’t feel guilty about putting them in a kennel.